First, I'm still working on the sugar post. Hold your horses!! It's a long one and quite involved so it's taking some time to write it. Now, I just want to take a moment here to gush a little bit about how much I LOVE the gluten free blogging community. Seriously, if it weren't for all of you, I'd still be eating gluten with reckless abandon. The other day, my buddy Heidi wrote an awesome post about me on her website Adventures of a Gluten Free Mom. She writes the craziest posts about how she tries to re-create "normal" kid food for her kids, especially Sam so he can feel normal at school. She created a gluten free Lunchable for him!!! Heidi also writes a lot other awesome posts about foods, recipes, tips... she's pretty awesome. Last week I received a blogger award from Maggie over at She Let Them Eat Cake! Maggie's blog is relatively new to me and I love it so far. She has been baking gluten free ever since her husband was diagnosed with Celiac 7 years ago. 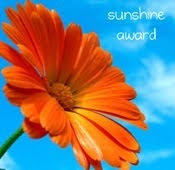 I'm a new reader of her blog but so far I love it, so I'm sending this award right back to her!! I'd love to share this award with some other bloggers that I love. I imagine that some of these people have already received this award but that's ok! I'm just going to make a quick little list of people that am a big fan of. WOW!!! Thanks so much for the shout out. I LOVE your blog too. I love the new direction you are taking with it, focusing on studying food from a really intense academic perspective. You write about nutrition in a way that's easy to understand... and I appreciate that so much! I'm a huge fan of Adventures of a Gluten Free Mom - i will be checking out the others you have listed!